Custom seat covers are made to fit your seat like a glove. Amazing fit & protection! Multiple fabric and color options from Neosupreme to Genuine Leather. 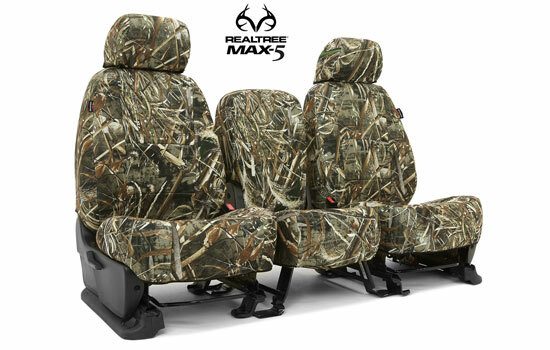 Protect your seats from wear and tear with these stylish camo seat covers from Mossy Oak, Realtree and more. Also available with tactical MOLLE option. National Car Covers is your best source for a wide selection of car seat covers for all types of vehicles. Every seat cover we carry is built to demanding quality specifications. Rest assured that our seat covers will protect your vehicle from the harshest elements that nature can dish out. Whether it’s punishing UV rays, or hauling the sports team to practice, every one of our covers are designed and manufactured to perform season after season for years to come. Innovative features, quality fabric and full custom fit are all found in every one of our products. 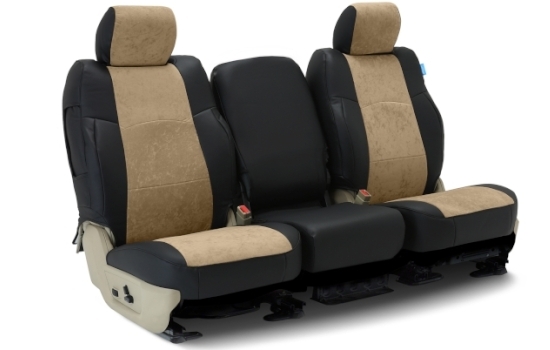 When choosing car and truck seat covers, it is important to know that you will be getting a cover with excellent fit; one designed specifically for you vehicle. All our custom seat covers are manufactured to fit your exact vehicle perfectly, right down to matching the OEM seam pattern on your seats. If you're looking for a perfectly snug seat cover that hugs your seat's every contour and curve, then a custom-fit car cover is what you want! Coverking is the manufacturer of these premium seat covers, and offers dozens of highly specialized fabrics that are constructed to your seat's exact specifications. They are made-to-order in the fabric, color, and style of your choice.